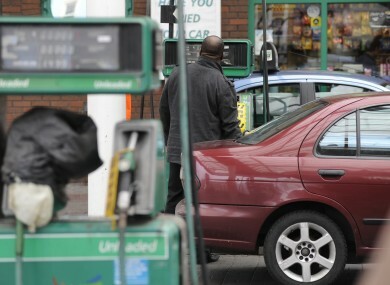 The AA says it is concerned that, for every litre of petrol purchased, 63.67% goes to the government. THE PRICE OF fuel in Ireland has dropped for a second successive month, and is now the lowest it has been all year according to the latest monthly survey from AA Ireland. A litre of petrol costs, on average, 135.1c while diesel costs on average 123.5c per litre. The cost of petrol has fallen 1c since last month, and diesel has fallen over 2c. However, as a whole, the cost of fuel in Ireland has risen significantly in the last 12 months. According to the AA’s director of Consumer Affairs Conor Faughnan, the fall in fuel prices in the last two months “only goes so far in counteracting a number of increases that we have seen in recent months”. In line with the drop in fuel prices this month, the AA noted a significant decrease in the cost of a barrel of oil. In April, a barrel cost $55.85. This month, it costs $53.34. Despite this fall in prices, the AA has reiterated its concerns around the tax levels imposed on fuel spend. The AA’s fuel prices survey found that tax accounts for 63.67% of the current price of a litre of petrol and 59.10% of the price of a litre of diesel. Faughnan said that people in rural areas were unfairly “punished” due to the high fuel tax rates. He said: “For many people in Ireland driving is a necessity due to an absence of reliable public transport, particularly in rural areas, or because the nature of their employment requires that they have access to a car. These people should not be punished by way of excessive taxation because they need a car to get to commute or access reliable employment. “During the recession era the tax on fuel was allowed to rise in response to the emergency situation, but despite the change in Ireland’s fortunes motorists are still being taxed to emergency standards,” Faughnan added. Email “The price of fuel is going down but motorists are still paying far more than they did last year”. Feedback on “The price of fuel is going down but motorists are still paying far more than they did last year”.